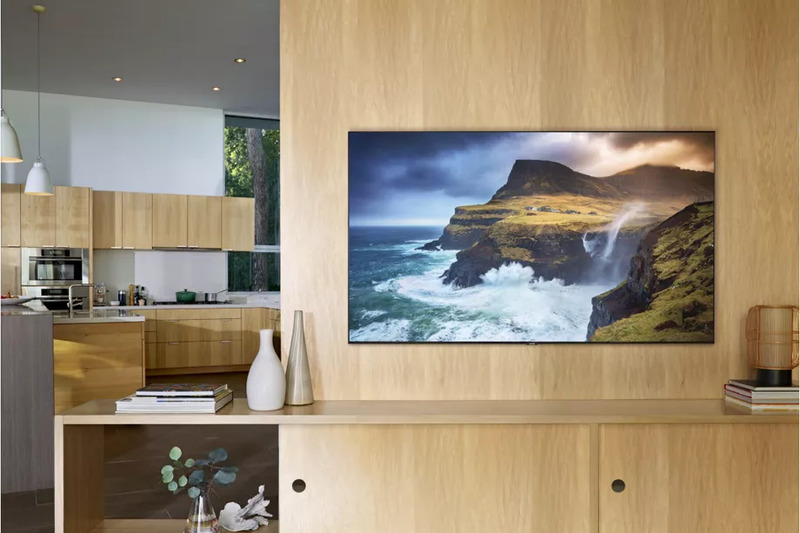 As promised, Samsung Electronics has unveiled its full lineup of Smart TVs for 2019, unleashing no less than 41 new models with a clear preference for much larger screens than in previous years. The new TVs, which have been launched a month earlier than Samsung traditionally does, include seven 75-inch displays, eight that measure 80-inches and above, and an insanely big 98-inch 8K QLED TV that was shown off for the first time at the Consumer Electronics Show in Las Vegas last month. Samsung’s focus on larger screen sizes is evocative of a wider trend in the TV industry. Sales of large screens (those of 65-inches and above) have increased every year since 2016 due in part to falling prices. And Samsung thinks they’ll become even more popular this year, citing data from IHS Markit that forecasts the market for 75-inch and bigger TVs to grow by 43 percent. Samsung is also pushing its QLED display technology harder than ever. 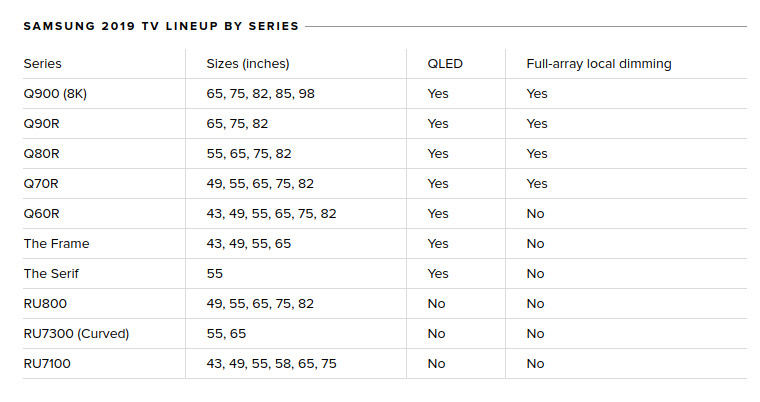 Of the 41 new models, 28 of them feature QLED, which are essentially LCD displays that use quantum dots to improve essential aspects of the image quality such as brightness, colour and contrast ratios. Samsung has been pushing QLED as a rival to LG’s OLED, and it’s generally been well received. However, most consider that OLED is still the superior option, and despite the problem of screen burn that may crop up after a few thousand hours of use, LG remains a firm believer in the tech. One of the highlights of Samsung’s new TVs are the improved viewing angles. Samsung’s Ultra Viewing Angle technology helps to address one of the main problems of LCD displays, in which the images have a tendency to fade when viewed from the side as opposed to face on. The technology is available in Samsung’s new Q90R and Q80R models, as well as its Q900 8K range. There’s also lots more full-array local dimming, which helps to improve LCD image quality fairly noticeably, according to all accounts. Full-array local dimming was already available in Samsung’s high-end models last year, but has now trickled down to cheaper models such as the Q70R. Other features include support for the new HDMI 2.1 standard, built-in access to Apple’s iTunes TV store for downloading movies and TV shows, plus support for Apple’s AirPlay 2 system for streaming audio. Amazon Alexa and Google Assistant are also supported, allowing for some voice control functionality. The only disappointment with today’s announcement is that there’s no mention of Samsung’s glorious new MicroLED TVs that were put on display at CES. MicroLED is a brand new display technology that’s considered to be as good as, if not better than OLED. It’s also more durable as it uses inorganic elements as opposed to the organic elements found in OLED, which means it’s immune to burn in issues. Sadly though, it looks as if consumers are in for a longer wait if they want to get their hands on a MicroLED TV. Samsung has only published pricing details (in US dollars only) for a handful of its 2019 models at present. These include the 65-inch RU8000, which is priced at $1,400 (around £1,088); the 65 and 55-inch Q60R, which cost $1,800 (£1,399) and $1,200 (£932) respectively; and the 65-inch Q90R and Q70R models, priced at $3,500 (£2,720) and $2,200 (£1,710) each. There's also the 8K Q900R, pricing for which starts at $5,000 (£3,886) for the smallest 65-inch model. Samsung hasn’t yet said how much the larger versions, such as the 98-inch flagship edition, might cost.